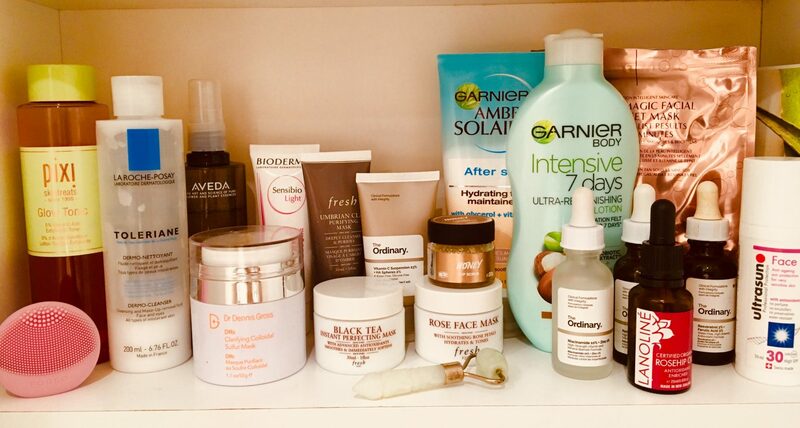 I discovered liquid exfoliators when I upped my skincare regimen about 4 years ago. Traditionally, exfoliators were physical with microbeads (bad for the environment), granules or sugar. If you lived in the UK or US during the 2000s, chances are you bought a couple of St Ives Apricot Scrubs in that time but (thankfully) since then, the exfoliation game has come on a long way. Physical exfoliation is not for everyone- people can find it abrasive, irritating, messy, environmentally unfriendly… the list goes on. If it’s not working for you, then perhaps a liquid/chemical exfoliator would be a better alternative. If you’re sensitive or dry, you might think that neither option are appropriate but shedding those dead cells will do wonders for a complexion, it’s maybe just a case of finding the right product- which can at times seem like a needle in a haystack. For me personally, a liquid exfoliator works really well- I just find it leaves my skin smooth, even and clear the next morning (I would suggest only using at night and follow the next day with sunscreen). Alpha H Liquid Gold. I got this having seen a lot of press coverage about it, and bloggers like A Model Recommends and Caroline Hirons were talking about it. There aren’t a lot of ingredients and the main ones are naturally-derived glycolic acid and hydrolyzed silk. The strange thing for me with this one is the application; you apply it to a cotton pad after cleansing and wipe it all over the face (avoiding delicate eye area). For maximum effect, you don’t put moisturiser or anything on afterwards (I KNOW) or if you don’t want too strong a treatment, apply moisturiser as normal. Which is strange right? You start by using once a week to slowly build up to 3 times a week. Claims are it will tackle pigmentation, breakout-causing bacteria, scars, and dullness. I’ll be honest, it’s been a while since I’ve used this, I didn’t repurchase and I can’t remember WHY?! The price has definitely gone up and it’s only 100ml. Apologies this is a rubbish review of this product, so let’s move on. Pixi- Glow Tonic. Now this is currently sitting in my bathroom cupboard and I’m a big fan. This is great for a first-timer because it contains aloe vera and witch hazel as well as the exfoliant- glycolic acid. It’s also extremely affordable (£18 for 250ml). This is gentle enough to use on a daily basis (evening) and is suitable for most skin types. Interestingly it contains perfume- which would normally put me off but this doesn’t give me any reactions or irritations. The glycolic will give a nice exfoliation to remove dead skin cells without being aggressive. The Ordinary AHA 30% BHA 2% Peeling Solution (otherwise know as the ‘red one’). From the mild to the extreme with this one. You may have seen this on social media because it’s red and looks like you’ve had an interview with a vampire. What’s an AHA and a BHA you ask? So alpha hydroxy acids (water-soluble) exfoliate the top layer of skin and beta hydroxy acids (oil-soluble) as well as exfoliating these get deeper into pores. This product is a combo of the two so it packs a punch and it really tingles on the skin. The colour comes from Tasmanian Pepperberry which is used to combat the irritation. The Ordinary recommends using this only if you are an experienced acid user- so not for the faint hearted. Like I said, it seriously tingles, the kind of tingle that makes you want to itch your face, but when you wash it off skin is seriously smooth but I would personally only go through this skin torture once a month. As with all Ordinary products it’s £6.30 people! Dr Dennis Gross Alpha Beta Peels. (Technically not liquid but not a physical exfoliator- the liquid is in the wipes) Using a combo of AHAs and BHAs these are individually packaged into 2 wipes which are to be used in 2 steps. Step 1 is the exfoliation part- glycolic, salicylic, lactic, mandelic, malic and citric (ALL THE ACIDS). Wiped all over the face until the pad is dry and then wait 2 minutes. Step 2 is the anti-aging neutralizer which contains resveratrol, retinol and vitamin c. You follow this with a moisturiser and you are good to go. I love the effects of the pads, they really work on texture, and tough on blemishes. They come in different strengths depending on your acid usage as well as a ‘glow’ version which leave a hint of fake tan. £77 for 30 treatments- not as good value as the glow tonic but unless you’re using these daily, these will last a good 3 months. Paula’s Choice Skin Perfecting 2% BHA Liquid Exfoliant. I recently purchased a small sample size of this as my first endeavour into Paula’s Choice as a brand. This is applied much like the Glow Tonic on a cotton pad. It’s BHA with salicylic acid so good if you’re experiencing blemishes and oiliness. I have to say, I’ve only used this twice but so far I really like it. I definitely noticed a brighter complexion the next morning so looking forward to using this more. £6 for a trial size or £28 for 118ml so it’s more mid-ranged in terms of price. There are a lot more liquid exfoliators out there but my face is only so big and resistant. If physical scrubs aren’t working for you, you may want to consider a liquid version and see how you get on! Thank you- glad you enjoyed it!